So today I’m faced with a challenge. We went to a new Italian restaurant for supper the other night, and it was wonderful—Salt & Pepper in the new Worthington shopping plaza on Oregon Pike, about halfway between Roseville Road and Landis Valley Road in Manheim Township. The best Italian food we have had since we moved here, other than homemade. I had delicious linguine and clams in red sauce, E. had an excellent chicken Parmesan and spaghetti, and M. had spaghetti in vodka sauce, a light and creamy red sauce. It was an excellent meal. The challenge, then, is to recreate the spaghetti in vodka sauce and make it even better than the restaurant’s version. I liked it, but I wished it had had a bit more of a spicy bite. I like my red sauces to have a little punch. 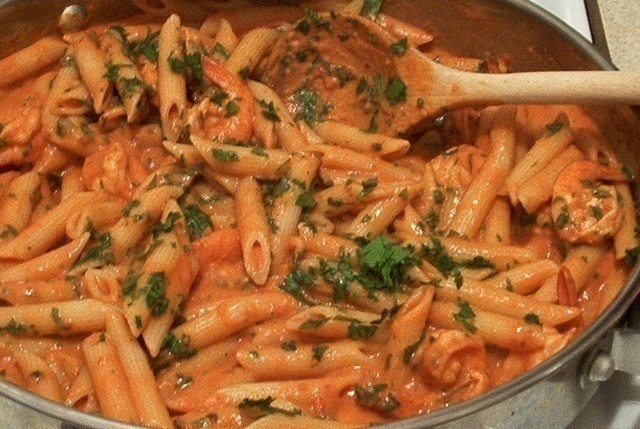 Vodka sauce, on the other hand, is not particularly robust, relying on subtle but complex flavors mixed to perfection. What I’ve done is replaced black pepper with white pepper, minced shallots instead of garlic, caramelized red onions instead of minced yellow ones, and a bit of sweet paprika and more red-pepper flakes than what most recipes call for. These changes add complexity to the dish. One further adjustment is that I use Absolut Peppar as the vodka in the recipe, but that is a personal vanity. Most any good vodka will do, but I truly like the layer of black pepper flavor it imparts. My favorite vodka is Blair and Brown, a true potato vodka made right here in Pennsylvania, but I’d rather savor that on the rocks with a bit of tonic and lime. Perhaps together? Try this recipe at home. Use penne or linguine instead of spaghetti, and whole-wheat pastas will add a bit more bite to the dish. I’m certain you’ll like it, and will serve it to guests. It’s a true winner, sure to garner oohs and ahs from your friends and naysayers who think that vodka sauce is a bridge too far. That’s a bridge I willingly cross. 1. Puree half of tomatoes until smooth. Dice remaining tomatoes into 1/2-inch pieces, discarding cores. Combine pureed and diced tomatoes in liquid measuring cup (you should have about 1 2/3 cups). Add reserved liquid to equal 2 cups. 2. Heat oil in large saucepan over medium heat until shimmering. To caramelize the onion, add onion and brown sugar and cook over a low-medium heat, stirring occasionally, until onions are light golden brown and soft, about 15 minutes. Add tomato paste, and cook, stirring constantly about three minutes; add shallots, paprika, and pepper flakes and cook, stirring constantly, until fragrant, about 30 seconds. 3. Stir in tomatoes and 1/2 teaspoon salt. Remove pan from heat and add vodka. Return pan to medium-high heat and simmer briskly until the alcohol is cooked off, 8 to 10 minutes; stir frequently and lower heat to medium if simmering becomes too vigorous. Remove the basil sprigs and stir in cream and cook until hot, about 1 minute. 4. Meanwhile, bring 4 quarts water to boil in large Dutch oven over high heat. Add 1 tablespoon salt and pasta. Cook until just shy of al dente, then drain pasta, reserving 1/4 cup cooking water, and transfer pasta back to Dutch oven. Add sauce to pasta and toss over medium heat until pasta absorbs some of sauce, 1 to 2 minutes, adding reserved cooking water if sauce is too thick. Stir in the minced basil and adjust seasoning with salt. Divide among pasta bowls, garnish with chopped basil, and serve immediately.